The Chad Valley DesignaFriend Model Doll - Tiffany is the first and at the time of writing only DesignaFriend doll to have pierced ears. Tiffany is a trend setter with her super long incredibly soft and delicate wavy hair, comes dressed in a stylish evening gown with appropriate footwear, a cute clutch bag, lady gloves and low hanging gorgeous earrings. Also comes complete with a change of clothes for daytime lunging in the form of a snazzy T-Shirt, stylish jeans, shoes and simple stud earrings. Tiffany comes gorgeously packaged in a carry case with space for hanging clothes on one side and fold-out model runway on the other side. Includes a lovely charm bracelet for your little one adorned with a heart pendant. Your little one can keep all Tiffany's appointments in check with the doll diary, which is also included. 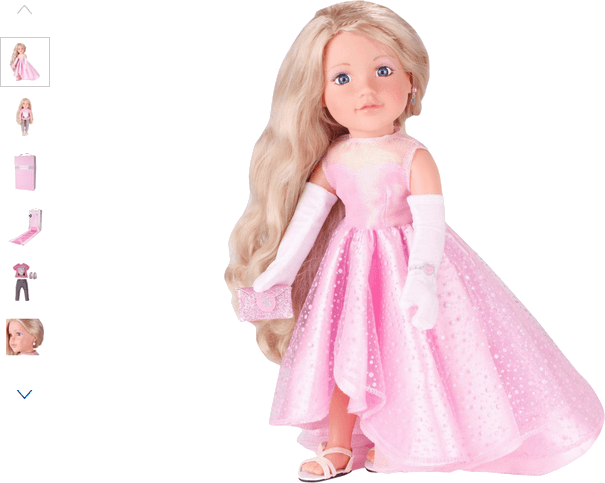 Get money off with April 2019 free Argos voucher codes, see if there's a promo code for the Chad Valley DesignaFriend Model Doll - Tiffany product. Argos may be out of stock of this product. To enhance your shopping experience you may also be redirected to a search results page when you click an outbound link.